News From The West Suggests India has No Time to Rest! While India is making a steady progress on the solar path, the world is moving at a faster pace. Stories from the west prove that there has been a paradigm shift in the energy industry and India needs to catch up soon. Renewable energy sources like wind and solar have become too mainstream in the west that the traditional utility companies are afraid for their jobs. Though India is doing a commendable job given from where it was a couple of years ago, it still has a long way to go. 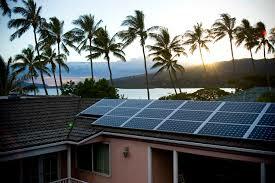 In news from California, residential solar is becoming mandatory. The state has made it compulsory for all new houses to have solar panels on their rooftops. Regulations mandating new homes to have some solar energy production by 2020, will be approved by The Energy Commission in near future. California is all set to become the first US state to make a transition to green homes. The state is also looking at implementing electric vehicles and energy storage solutions in a big way. Solar energy is estimated to save owners $50,000-$60,000 in operating costs over its expected lifespan of 25 years. In another news from Colorado, there will be no solar bids without energy storage options. The entire West Coast of the US is looking at only solar-storage hybrid projects. Many utility companies in the west are also looking at deploying solar plus storage plants to relieve congestion during peak times. On the other hand, India has been witnessing a surge in cancellations of solar plus storage lately, with the Andaman & Nicobar Islands is the latest one. Two solar storage projects at two different solar parks in Karnataka and Andhra Pradesh have been canceled so far. NTPC also canceled a 50 MW solar-storage project tender planned in Andaman & Nicobar Islands. It will still take some time for these projects to gain momentum in India as the cost of solar plus storage is still double than that of a normal solar project. However, given the advancement in technology and going awareness about climate change concerns, India will soon see a surge in solar plus storage solutions. In fact, SECI has invited bids for another storage-equipped solar and wind hybrid project in Andhra Pradesh to test the waters. The country has been facing a slew of challenges in the form of various duty impositions, grid issues and lack of proper transmission infrastructure. India still has a long way to go before the solar market gets matured. Mere installation numbers cannot be the sole parameters to judge success. It is only when the country is able to formulate clear guidelines in all the matters above, will it be able to take a big step towards the successful and mass adoption of solar plus storage solutions.